To help protect iTunes accounts from hackers, Apple recently required users to set up a few security questions and provide a backup email address. But some users aren't happy with the questions Apple asks. According to The Register, members of Apple's support forums have been complaining that some of the questions are too difficult for the user to answer, while others are too easy for strangers to guess. The questions include "In which city were you first kissed?," "Where was your first job?," and "Which of the cars that you've owned has been your favorite?" "The questions are not secure, some are public knowledge and some I don't even know the answer to myself, so I would have to fake an answer, which then I won't remember," one user writes. 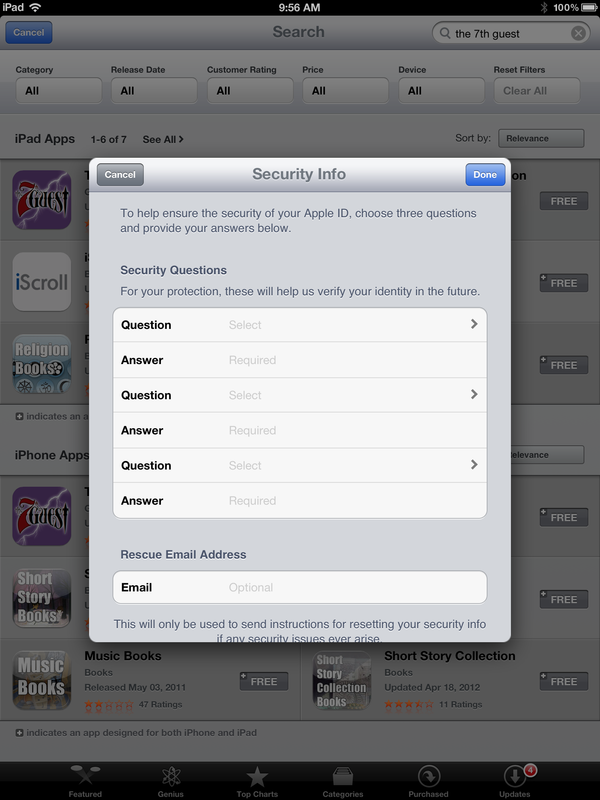 "I hope Apple will allow you to choose your own questions as I've forgotten mine already," writes another user. Yet another user posts, "These questions are ridiculous, and impossible for me to answer. I haven't had a job, a car, or my first kiss yet, making it impossible for me to answer three of the five questions. Now I can't download anything from iTunes." Some users are also complaining that Apple's request for a backup email address doesn't work properly. Apple requires users to enter a different email address than the one currently associated with the user's iTunes account, but iTunes is having trouble accepting a second address for some users, including me. Providing a backup email address is apparently optional, but Apple doesn't make this clear. An option to provide a phone number instead might have been helpful.